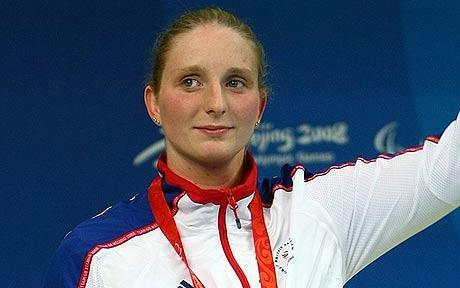 This week British women Olympians featutes Heather Frederiksen. Heather is already a very successful British Paralympian and is expected to carry on that success at this summer’s games in London. After a serious accident in 2004 that left Helen with limited use of right arm and leg it was clear that she would need to use a wheelchair. At the time, the doctors had told Helen that she would never swim again. Before that point, Helen had won both the British 10 km Open Water Championship and 4.5 km British Grand Prix on the same day. Despite this, in 2006, whilst watching television coverage of the swimming events at the Commonwealth Games, in Melbourne, that Helen decided she wanted to swim again. After her Paralympic success she said of the experience, “I saw Joanne Jackson win the gold in the 400 m and I just said to myself, ‘I’m not ready to finish. I’ll finish when I want to finish, not when someone else tells me to’. Helen now competes in the S8 (backstroke and freestyle), SB7 (breaststroke) and SM8 (medley) classifications. Her first senior swim meet came at the 2007 German Open, in Berlin. In her first appearance at the British Championships in 2008 Helen won two gold and two silver medals from her six events and set a number of national records. At the 2008 Summer Paralympics, in Beijing, she competed in five events and won four medals. Her first medal, a silver in the women’s 100 m freestyle – S8 final on 8 September, was followed two days later by gold in the women’s 100 m backstroke – S8 in a new IPC world record time of one minute 16.74 seconds. Helen won bronze in the 200 m individual medley and her final medal of the games came with a silver in the 400 m freestyle. In her final event, the 50 m freestyle, she reached the final but finished in 7th position. Amazingly Helen holds a number of different records in addition to her 100 m backstroke world record. She is also the current holder of the 50m freestyle world record, the 100m freestyle world record, the 200m freestyle world record and the 400m freestyle world record, European records in the 50m, 100m, 200m, 400 m freestyle, 100 m butterfly, 100m backstroke S8 classifications, and holds the British record in a total of six different events.